Have you ever taken a bite of something and it was just…bland? It needed something? Well, that something is herbs. Not only do they add that “je ne sais quoi” to foods, they also boost your health. 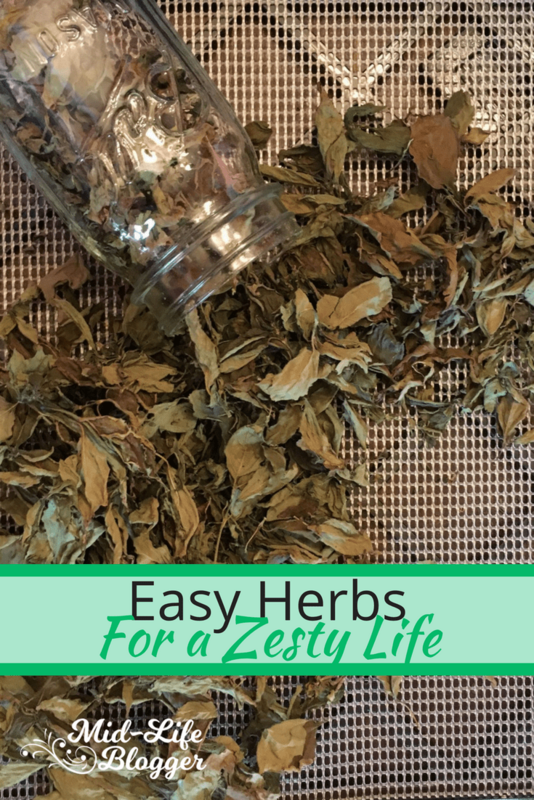 In many ways, herbs add zest to life! Herbs are among my favorite plants to grow. They’re as easy as weeds and have few to no pests. Dill and cilantro come to mind as two of the easiest. I let a few plants go to seed and when they dry I sprinkle seeds over my raised beds and let them come up where they may. I actually find it hard to pull up all of the excess seedlings to make way for the other things I want to grow, but that’s a good problem to have. Dill and parsley, which are in the carrot family, play host to swallowtail butterfly caterpillars. I have plenty to share and don’t mind them eating their fill. Parsley is a little different in that it’s a biennial, meaning it flowers and sets seed it’s second year. It’s not quite as quick and easy to renew itself so I sometimes have to replant it. Chives make pretty lavender flowers. They, too, will produce many seeds and quickly spread, so that’s one that you might want to deadhead and control. I found a recipe for Chive Flower Vinegar, so I tried that for the first time this year. It was quick and easy to make and I’ve used it to for vinaigrettes. I also keep minced chives in the freezer to add to my scrambled eggs or other dishes. Basil is another of my favorites. It grows in the heat of the summer, and I usually put some among the tomato plants. It dries beautifully and is so nice to have on hand. I like to use it in my pasta sauces. Another favorite use is in La Madeleine’s Tomato Basil Soup. We love Mexican food, so along with cilantro I also grow oregano. I grew some chamomile a few years ago for herbal tea, and two years later it still comes up voluntarily. It makes pretty little Daisy-like flowers and has a pleasant scent so it can also be used in crafts such as potpourris. Mints are extremely easy to grow. They can become invasive, so it’s best to keep them contained in some way. I have spearmint and chocolate mint growing in raised planters. Walking out the back door to grab a sprig for my iced tea is a simple summer pleasure, but I also dry some for use in herbal teas. Herbs have such concentrated flavors that you don’t usually need much at a time, so I use my Excalibur dehydrator to preserve them for later use. I’ve had mine a few years now. It has nine trays so I can dry a lot at once. Besides using them in cooking, I use dried herbs to make my own seasoning mixes. Although most herbs dry really well, cilantro is one exception. It retains its flavor much better when frozen. I’ve done it different ways, but usually I rinse it, spin it dry, roughly chop it, and put it in a baggie. If I’m in a hurry I skip chopping and just shove it in a baggie. Since I use it most often for salsa, it gets thrown into the food processor, anyway. I like gadgets that help to make my work easier or more fun. These herb scissors make quick work of mincing leaves. Besides adding flavor to foods, herbs have other uses such as medicinal and crafting. In the garden they can help protect other plants from pests. Dill, for example, repels aphids, squash bugs, and tomato hornworms. On the flip side, herbs attract beneficial insects such as ladybugs and hoverflies. They’re an organic gardener’s friends. Herbs are so easy, they’re the perfect plants for beginning gardeners. They don’t take much room or attention, and most can even be grown in part shade. Even if you live in a small place, you can grow them in pots on the porch or a sunny windowsill. I get a kick out of using herbs I grow myself. It saves money, makes food more flavorful, and they have nutritional benefits, too. Herbs add zest to life. Go ahead and give them a try! This is something I hope to be able to try one day. I. Would love growing my own herbs! They don’t need much in the way of time or attention, so I hope you do. I bet you’ll enjoy them. I bet your garden smells amazing! How do you use your dill to repel pests? Is it just through companion planting or do you mix up a spray? Just through companion planting. I don’t really smell the herbs unless I’m picking them, or brush against them. Our dill went crazy this year–8 feet tall and the heads were 10 inches across. I have no idea why, but it was some trick to use one head in each jar of pickles–hardly had room for the cucumbers. Oh, that’s funny! What a problem to have! That’s what I use them for mostly. I like to keep chives in the freezer to use. We love them in our scrambled eggs!